The Provand’s Lordship is the oldest house in Glasgow and was built in 1471 and was originally part of a hospital. Remarkably refurbished and now open to the public, you can step back in time and get an eerily real taste of what life may have been like in the medieval city. The St Nicholas Garden sits behind the house and is a medicinal herb garden. Recreated in the style of the 15th century, the garden offers a tranquil sanctuary away from the hustle and bustle of the town. Only a ten minute walk from Buchanan Street bus station it is very accessible. You will also find adjacent to this magnificent building is the St Mungo's Museum and Glasgow Cathedral. Provand's Lordship was built in 1471 by Andrew Muirhead, the Bishop of Glasgow, as part of St Nicholas's Hospital, which stood to the south of the house. The "front" of the house probably originally faced west, and the site now occupied by the St Mungo Museum formed part of the large and impressive Bishop's Castle, one of the most important buildings in medieval Glasgow. Beautifully preserved, the “Auld Hoose” is furnished with a fine selection of 17th-century Scottish furniture donated by Sir William Burrell, and a collection of historic royal portraits. The three storey building comprises of three main rooms, each of which are connected together by a spiral staircase. Low ceilings and doorways, narrow passageways and original flagstone floors are throughout Provand's Lordship. Room settings display a taste of household interiors around the years 1500 and 1700, so you can get a flavour of life in medieval Glasgow with a visit to this fascinating building. 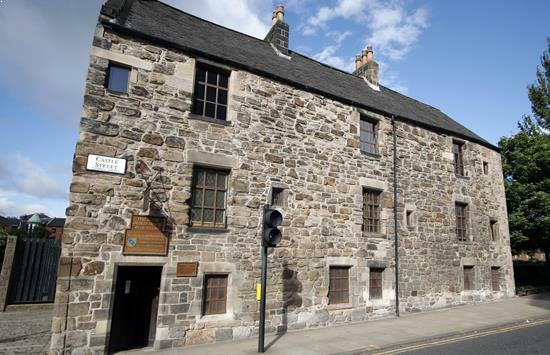 The House is one of only four surviving medieval buildings in Glasgow. Once you have toured the house, visit the St Nicholas Garden located to the rear of the house, where you can relax and enjoy the peaceful atmosphere. This garden has been recreated in the style of gardens in the 15th Century, which were originally for culinary or medicinal use, Surrounding the garden, the cloistered walkway displays an interesting collection of carved faces. The strange stone masks are known as the Tontine Heads or Tontine Faces. Over the years, these stone masks were lost then eventually unearthed at various sites around the city. They were finally re-established in 1995 when the St Nicholas Garden opened.